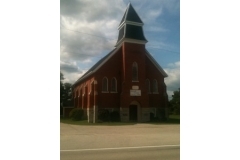 Pioneer settlers attended a Community Sunday School on the 2nd line of Luther and church services were attended at Petherton in a log church where a Presbyterian minister was preaching. In the late 1850's, a Presbyterian Missionary toured the area with a view to organizing several Presbyterian congregations. Conn appears to have been the first as earliest mention of Gordonville was in the minutes of Knox Church, Conn, July 17, 1877 when plans were made for their first Communion. In 1886, Robert Sim and his wife supplied the land for a brick veneer Church from Lot 18, Con 1, Arthur Tsp for the nominal fee of $1.00 to make it legal. First placed on the Conn Charge, Gordonville became a part of the Arthur, St. Andrew's charge in 1889. We are a small country church that meets to worship God and share the Hope we have because of the Gospel of Jesus. Our service time is 9:30am from Sept. 1 till June 30. Feel free to come and join us, we would love to see you.